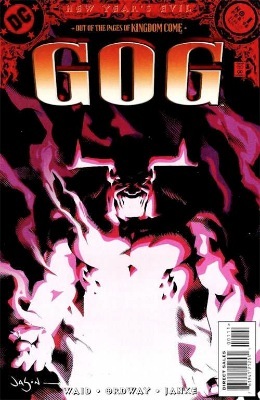 Galactus is a god-like being who was created during the union of the Sentience of the Universe and Galan of Taa. He is the first and oldest living being in the universe and is described as "the physical, metamorphosed embodiment of a cosmos." To sustain himself, Galactus must consume the energy of living planets. This leads to him consuming and destroying several planets, including the Skrull homeworld. 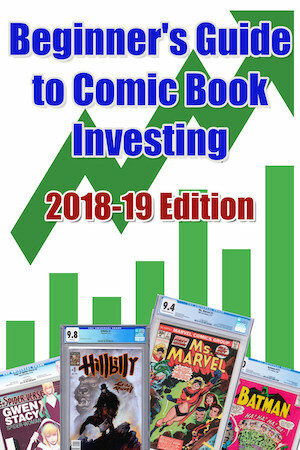 See our Fantastic Four comic book price guide for more key issue values. Remy Etienne LeBeau is a Louisiana mutant with the power to kinetically charge any object. He is an expert fighter with a bo staff, and uses his mutant powers to turn normal playing cards into deadly projectiles. Before joining the X-Men, Gambit was a master thief who wandered the world stealing and committing various crimes. Because of his background and ties to Mister Sinister, Gambit was distrusted by most of the X-Men, especially Wolverine. 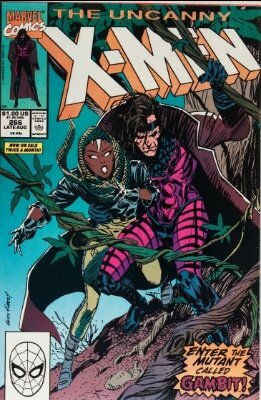 Rogue is Gambit's main love interest. Even when Apocalypse turned Gambit into Death (of the Four Horsemen), Gambit could not bring himself to kill Rogue. Steven Sharpe III was a gambling addict, who believed that a life of crime, thievery, and luck were the secrets of success. 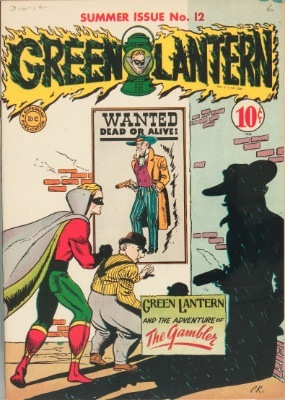 With a few high profile robberies under his belt, Sharpe became the target of Green Lantern. Later, Sharpe helped found the first Injustice Society. After Sharpe III's death, his grandson, Steven Sharpe V, takes over the Gambler identity. 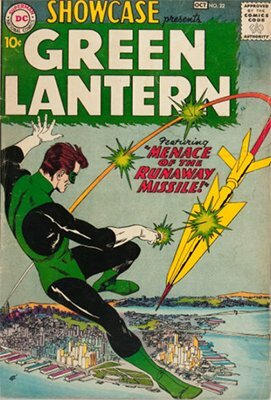 See our Golden Age Green Lantern comics price guide for values from this rare series. Edward Cobert was a S.H.I.E.L.D. scientist who tested one of his experiments on himself. As a result, he became a hulking beast with limited intelligence. Cobert was brought under the control of the Mad Thinker, who began calling him Gargantua. Later, Gargantua joined Dr. Octopus's Masters of Evil. Gargantus was Iron Man's first enemy. He was an android disguised as a Neanderthal, sent to Earth by an alien race. Iron Man easily defeated Gargantus, pulling his metal body apart with high-powered magnets. The first Gargoyle was Yuri Topolov, a Russian scientist who was mutated into a giant, grotesque monster with extremely high intelligence. 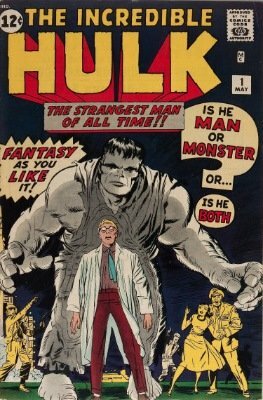 While originally battling the Hulk, Bruce Banner (the Hulk's human self) cured Yuri of his deformity. Later, Yuri dies killing several Russian generals in an explosion. Isaac Christians was the second Gargoyle. Christians sold his soul to the demon Avarrish in exchange for a new life, and to revitalize his home town Christiansboro, Virginia. As payment, Christians had to become a gargoyle and work for the Six-Fingered Hand. 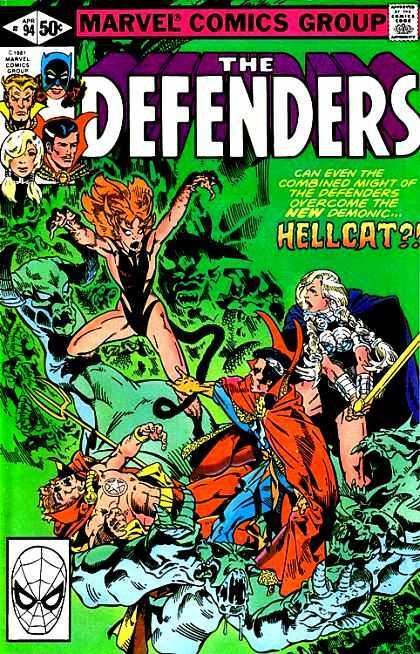 Later, he goes on to join the Defenders. Gearhead, real name Nathan Finch, is a Batman villain who possesses genius level intelligence. After plunging several feet and suffering terrible frostbite, Finch's limbs are replaced with cybernetic prosthetics by Dr. Bascomb. After he awakens, Finch becomes Gearhead, and develops his own arsenal of removable body part weapons. Ulysses Armstrong was a psychotic teenager with the mind of a military genius. To escape from military school, he burned the school down, killing everyone inside. 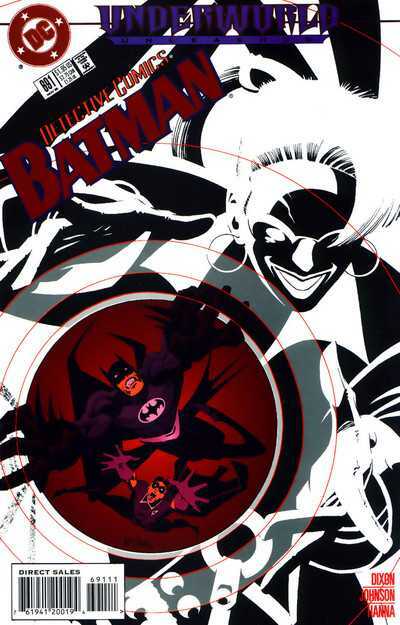 Fleeing, Armstrong comes to Gotham City, and begins building an army of criminals and thugs. Eventually, he is stopped by Batman and sent to a juvenile detention center. Years later, Armstrong appears again as the second embodiment of Anarky. General Zod is a criminal warlord from the planet Krypton and one of Superman's greatest enemies. As a result of his evil and tyrannical ways, Zod was banished to the Phantom Zone, until Superboy released him. 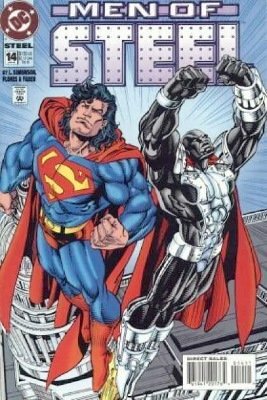 General Zod possesses nearly the same level of power as Superman, but often loses their battles because of his arrogance. Get your copy of this comic valued today FREE. 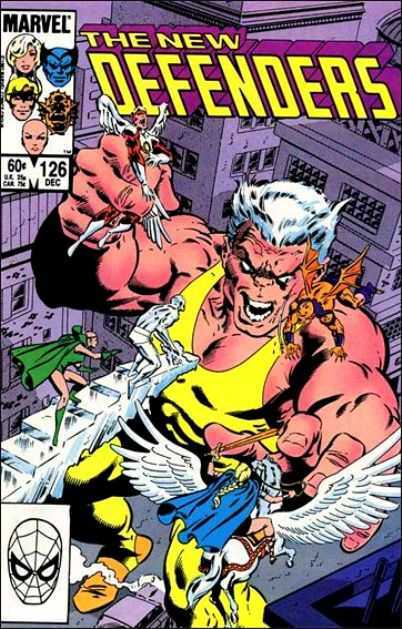 Generation X was a super-team of young mutants, started by former X-Man Banshee and the formerly villainous Emma Frost (White Queen) in the wake of the Phalanx attempt to absorb all mutants. These young mutants were, with the exception of Jubilee, new characters who had not trained at Charles Xavier's school, but instead had been trained by Banshee at his splinter school. 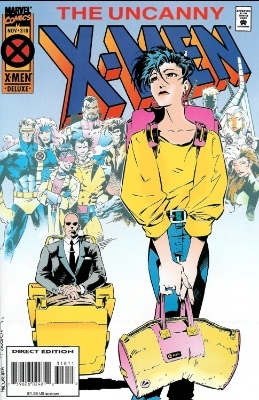 The team originally consisted of Jubilee (who left the X-Men to join Generation X), Skin (a mutant with extra, stretchy skin who can change his appearance), M (actually a pair of twins posing as their older sister, with the powers of telepathy, opening inter-dimensional portals, and merging into a single, "gestalt" form), Husk (a mutant who can give herself a new shape and appearance by shedding her existing skin to reveal a new one underneath), and Synch (a mutant who can synch up with other mutants in the area, giving him their superpowers). 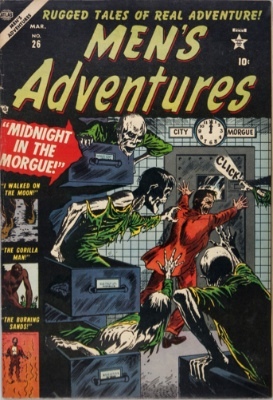 The team and the series lasted 75 issues. All the original characters are still alive and active, except for Skin. Jim Craddock was a notorious highwayman, robbing and murdering dozens of people during the 1800s in England. After he is killed by Nighthawk, Jim lives on as a ghost. In order to be resurrected, his killer must die and "pass on to the next plane of existence." However, Nighthawk is eventually resurrected as Hawkman, thus Craddock remains a ghost. Later, Gentleman Ghost joins the Injustice League and the Secret Society of Super Villains. Ghaur is the leader of the Deviants, and is master manipulator and fierce enemy of several Marvel superheroes. Ghaur possesses the ability to mind control nearly everyone, and briefly had superhuman strength and durability. Johnny Blaze was a stunt-cyclist who sold his soul to a supernatural being he thought was Satan, in exchange for saving his adoptive father, also a stunt-cyclist, from cancer. The being was not Satan, but rather Mephisto, who nonetheless made a devil's bargain with Johnny. Mephisto cured Johnny's "father," and instead had him die in a motorcycle crash. 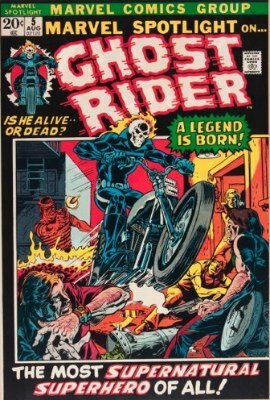 Johnny complained, and while ultimately Mephisto was unable to take Johnny's soul, he was able to fuse a demon named Zarathros with Johnny's soul, which transformed him into a Ghost Rider whenever trouble or evil was afoot, converting his flesh into flames within his leather motorcycle suit. He had the powers of super-strength, stamina, and invulnerability, and the ability to project "hellfire" against his enemies. Eventually, Zarathros' hold on Johnny's soul was broken, and Johnny was free from its influence. Click here to read our full article on Ghost Rider comic values. Gilotina is a New God of Apokolips and an original member of the Female Furies. Gilotina has the ability to chop through anything with her hands. Later, Gilotina and her team are defeated by Wonder Woman, and she hasn't been seen since. Tony Woodward was a steel plant worker who was thrown into a vat of molten steel. Little did anyone know, the vat contained scraps from a S.T.A.R. Labs experiment. These scraps transform Woodward's body into iron, giving him superhuman strength and durability, and he adopts the alias Girder. Later, Blacksmith recruits him as one of the members of the Rogues. After a series of robberies, Woodward is apprehended and sent to Iron Heights Penitentiary. Gizmo is one of the founding members of the Fearsome Five. He uses his genius level intellect to invent deadly weapons out of average, everyday objects. Gizmo and his villain colleagues often clash, resulting in Gizmo quitting his life of crime, being shrunk to a microscopic level, and finally, being killed by Sivana. 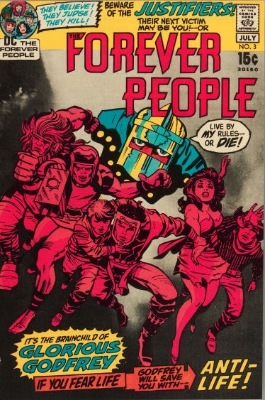 Glorious Godfrey hails from Apokolips and is a member of Darkseid's Elite. Godfrey is sent to Earth to start a hate campaign against superheroes. Eventually, he is successful, and all super human activity is outlawed. Later, Godfrey is stopped by the Justice League of America. Refusing to surrender, he puts on the Helmet of Doctor Fate, but his mind is wiped and he falls into a vegetative state. Goddess is the physical representation of Adam Warlock's moral, good self. 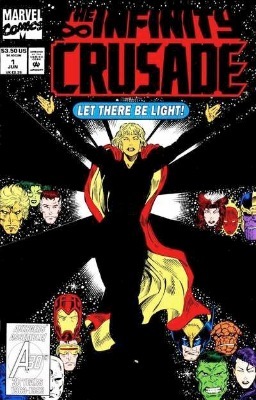 She is created when Adam uses the Infinity Gauntlet. 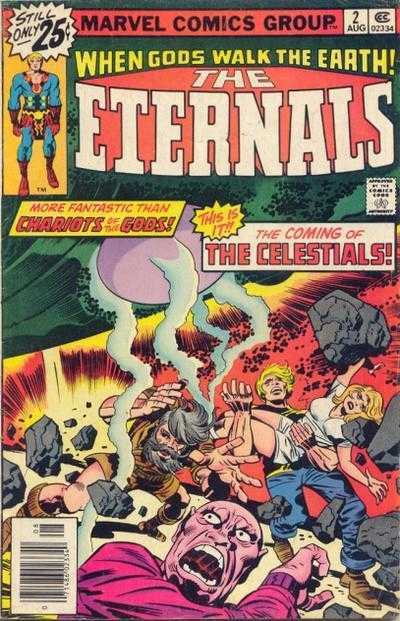 Marvel's superheroes learn that Goddess' ultimate goal was to rid the world of sin and anything capable of sin. She is defeated, and her spirit is absorbed into a soul gem. Following a nuclear explosion in Kansas, William Matthews becomes infatuated with Superman, believing him to be a religious messiah. However, when Superman tells him otherwise, William is shattered and goes insane. Later, Shazam, Ganthet, Zeus, Highfather, and the Phantom Stranger give William portions of their power, and he goes back in time to kill Superman. He succeeds, and continues going back in time to kill Superman over and over. 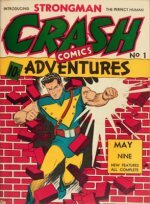 Charley Parker was a Midway City orphan who idolized Hawkman. In one version of his story, he somehow transformed into a nearly identical version of Hawkman, and joined the Justice League of America. More recent retellings of Parker's story identify him as Fel Andar's son. Fel Andar was a Thanagarian who became Hawkman. Lisa Snart is a world-renowned figure skater and the sister of Captain Cold. After the death of her lover and mentor, Snart blames Barry Allen (the Flash), and she swears vengeance. 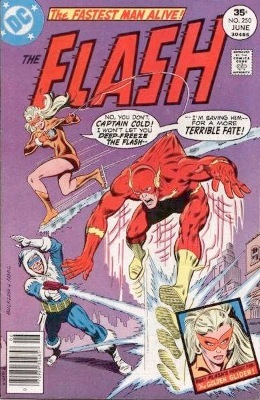 Donning an ice-skater's costume, a mask, and skates which create their own ice, Snart begins a life of crime with her brother, ultimately seeking to kill the Flash. 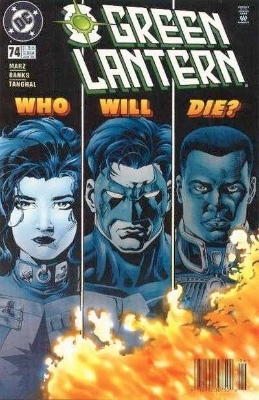 Later, Chillbaine kills Lisa, but since the start of the New 52 rewrite, she is alive. 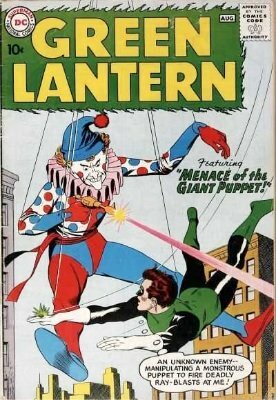 The transformation of Betsy Ross into a superheroine was an odd one, given all the retcons that followed. 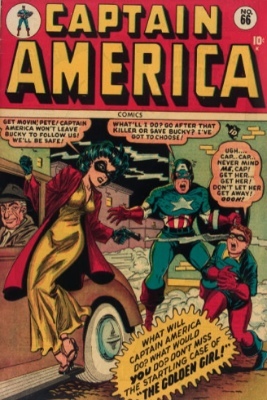 When Bucky is critically injured, Captain America needs a new sidekick, and reveals his secret identity to Betsy. She joins him to track down Lavender after Cap trains her for an unspecified time. She later married Mace and retired from crime-fighting in 1953. Using a gold-imbued potion, scientist Keith Kenyon gains superhuman strength and durability, but his skin emits a golden glow. 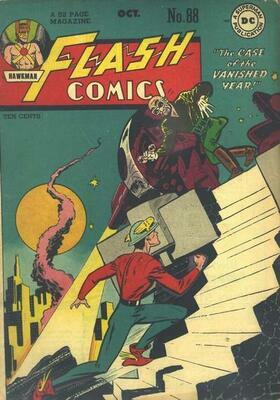 Using his new powers, Goldface launches a life of crime and battles with the Green Lantern and the Flash. Goldface uses a gold plated armor and a gun that shoots liquid gold to gain the upper hand against the Green Lantern, whose powers are diminished against yellow objects. 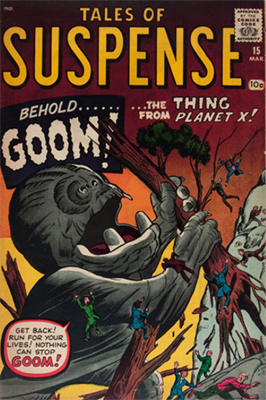 Googam is an 8ft tall alien from the planet X. He was brought to Earth by his father, Goom, and placed in a cave while Goom attempted to invade Earth. 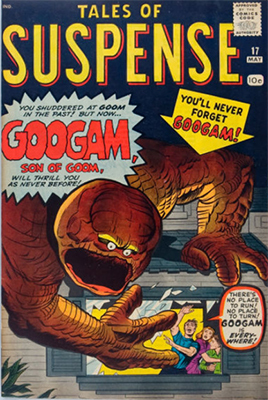 When a young boy discovers the alien in the cave, Googam follows the boy back to his house. The boy challenges Googam to a game of tag and he leads Googam into a pit of quicksand. Surviving the quicksand, Googam goes on become civilized, taking up a job at the Baxter Building, and even appearing on Late Night with David Letterman. Click to have yours appraised! Using his advanced alien technology, Goom attempts to conquer Earth. 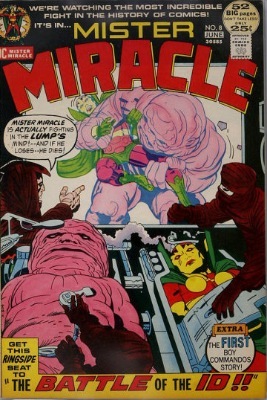 Goom is swiftly defeated by Beast, Hulk, and Mister Miracle, and exiled to the Negative Zone. Goom's disappearance left an impact on his son Googam, who stayed on Earth but missed his father dearly. Have one to sell? Click to get a super-fast offer! Once just a normal gorilla, Gorilla Grodd was empowered with super intelligent and telepathic abilities after an alien spacecraft crashed near his home. 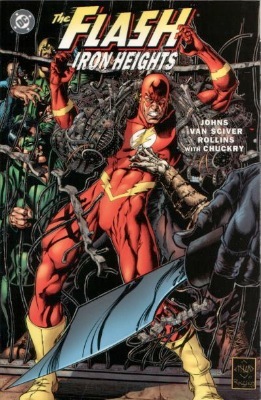 Grodd and his gorilla cronies establish Gorilla City and plot to take over the world, before being stopped by the Flash. Despite being defeated every time, Grodd has attempted to destroy humankind over a dozen times throughout the years. Gorilla-Man is the name of three different characters that have appeared throughout the Marvel Universe. 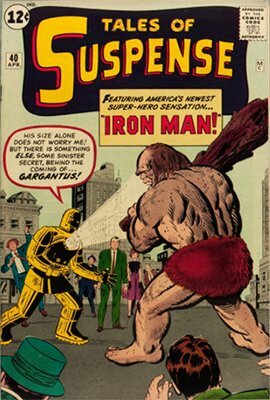 In each story, Gorilla-Man was once a normal human that was transformed into a gorilla. Ken Hale, killed the first Gorilla-Man and was then transformed into the next Gorilla-Man, becoming amazingly strong and immortal. Later, he helped the X-Men navigate through the jungle and became their ally. Got comics? Sell them to us! William Burnside was obsessed with Captain America, researching and analyzing his life extensively. In his research, Burnside discovers the secrets of the Super Soldier serum. Burnside undergoes surgery to look exactly like Steve Rogers (Captain America), hoping the FBI will give him the Super Soldier serum so he can become the next Captain America. 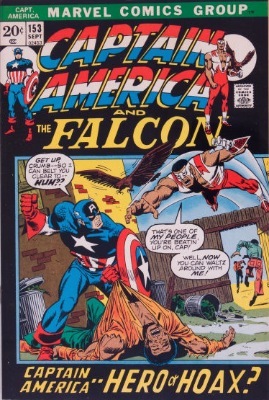 However, when the FBI refuses, Burnside takes matters into his own hands and injects himself and his friend Jack Monroe with the serum, becoming the new Captain America and Bucky. However, the Super Soldier serum they used caused them to become paranoid and violent, and they are put into a medically-induced coma by the government. 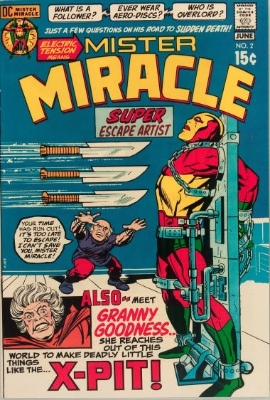 Granny Goodness is a New God of Apokolips and leader of the Female Furies. Beginning life as a peasant in Apokolips, Goodness slowly rose up the ranks, becoming one of Darkseid's closest allies. She was in charge of the Apokolips orphanage, training children to become killing machines. Later, she is killed by Infinity-Man, but is reincarnated on Earth. Franklin Hall was a Canadian scientist who was heavily committed to his research on gravity. One day, after a miscalculation, Hall's body is merged with graviton particles, allowing him to control gravity. 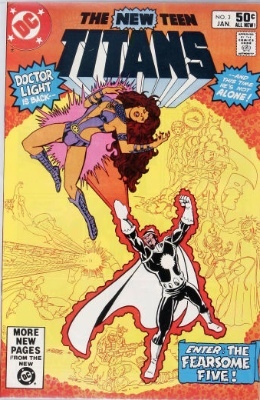 Instead of using his powers for good, Hall becomes Graviton and begins terrorizing others, until being stopped by the Avengers. In addition to being able to control gravity, Graviton can fly and teleport great distances. Grayven is the third son of Darkseid and an amazingly formidable foe of several DC superheroes. In the beginning, Grayven went on a galactic rampage, destroying several planets before being stopped by the Green Lantern. Later, he attempts to take over Apokolips, but is defeated by Superman and banished to Earth by Darkseid as punishment. Grayven is later killed by Infinity-Man. 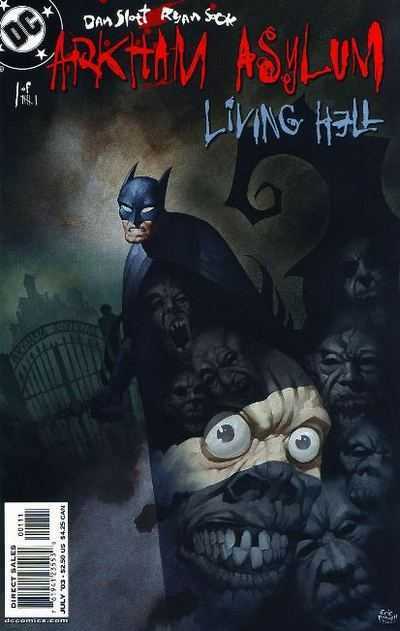 When Warren White pleads guilty by reason of insanity, he is sent to Arkham Asylum, hoping for a life of ease compared to what prison would have to offer. In the asylum, White is terrorized by several inmates. First, Killer Croc cuts "gills" into White's neck, and later, he is locked in Mr. Freeze's subzero cell, causing him to lose his hair and turn stark white. Filing his teeth down to points, White becomes the Great White Shark and rises the ranks of Gotham's underground, becoming a crime lord – all from within the confines of Arkham Asylum. Green Arrow is millionaire industrialist Oliver Queen, a sort of mash-up between Batman and Robin Hood. 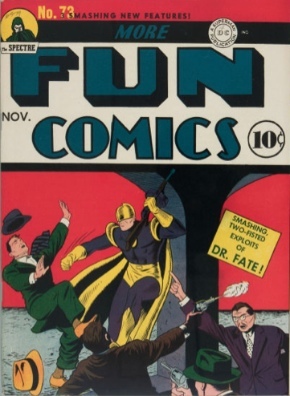 He had no super-powers as such, but was a master marksman with bow and arrow, made trick arrows with extraordinary powers, was a great detective, and an excellent physical specimen. 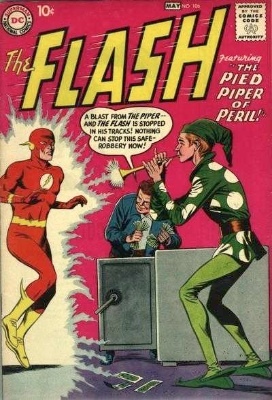 His teenage sidekick, Speedy, was an orphan named Roy Harper, Jr. He had an arrow car and an arrow plane, and dressed, originally, like Robin Hood. After many ups and downs, and partnerships with Green Lantern, Batman, and love interest Black Canary, Green Arrow is still going strong. 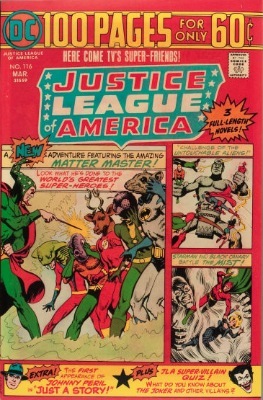 This issue also saw the first appearance of Aquaman. Green Goblin is one of Spider-Man's most enduring and lethal foes. He is characterized as being quite insane, cunning, and amazingly powerful. Over the years, four people have been the Green Goblin, most notably, Norman Osborn. Osborn created the serum that can turn people into the Green Goblin, as well as most of Green Goblin's inventions. Osborn has three children – Harry, Gabriel, and Sarah. Harry and Gabriel both take up the Goblin identity. Green Goblin is gifted with superhuman strength, intelligence, and healing, but as a result of his mental stability. 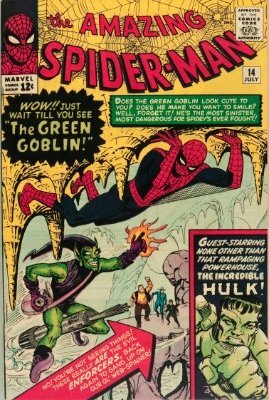 Many readers consider the Goblin to be the ultimate in Spider-Man villains. 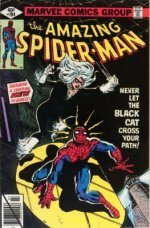 This has fuelled demand for his first appearance, making Amazing Spider-Man #14 one of the ultra-key Spidey issues. 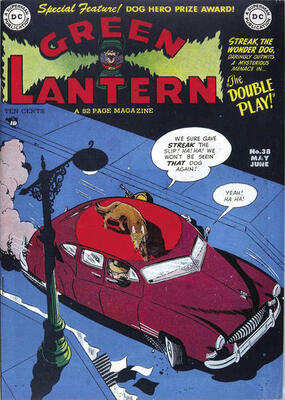 Alan Scott was an average railroad engineer when he found a mysterious and mystical old green lantern. The green flame within the lantern started talking to Alan after a railroad bridge collapse caused by foul play, explaining to the young man how to make a ring of power from the metal of the lantern. Alan did so, and became The Green Lantern, able to use his wondrous power ring to fly and perform hundreds of other wondrous tasks. The ring was powerless against anything made of wood, much as the better-known Silver-Age Green Lantern's ring was powerless against the color yellow. 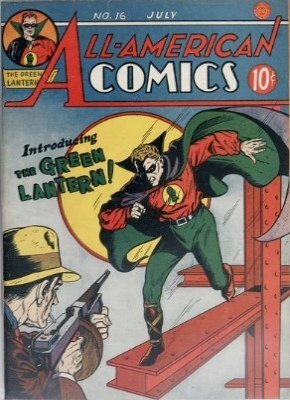 Alan Scott would be revived in the late 1950s after Jay Garrick's revival, along with the other Earth Two superheroes, as an elder statesman of sorts. We'll value your copy of this comic! Hal Jordan was an ordinary test pilot. He was mystically summoned to the crash site of an alien named Abin-Sur, who with his dying breaths explained to Hal that he was a member of the intergalactic Green Lantern Corps, devoted to maintaining order and justice in the universe. He asks Hal to take over for him as the Green Lantern of Earth's sector of the galaxy, and Hal agrees. Whenever he touches Abin-Sur's power ring to the green lantern it goes with, he recharges the ring for 24 hours, giving him tremendous powers, over everything except things colored yellow. Eventually, Hal encounters the Guardians, the ancient race behind the Corps. After Hal Jordan's death, others become the Green Lantern of Earth's sector. Johnny Horton was just another petty criminal until he joined the Secret Empire. As a member, Horton was surgically imbued with wings, a mane, lion paws and a tail. 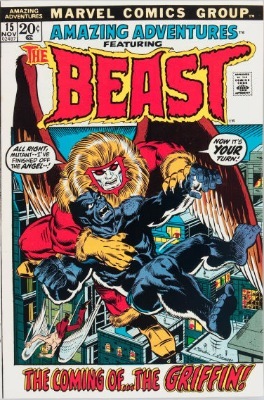 He was also given a serum that gave him superhuman strength and speed, completely transforming him into the Griffin. His overall role in the Secret Empire was to assassinate superheroes, including Beast and Angel. Own this comic? We'll give you a valuation. 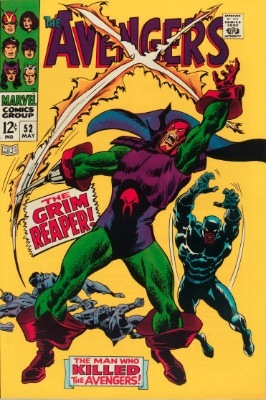 The Grim Reaper (no relation to the Marvel Silver Age villain of the same name) was a non-super-powered masked adventurer who fought the Axis powers. 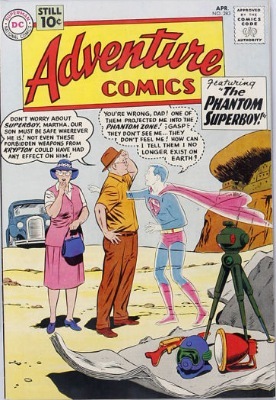 His origin was revealed later, in Wonder Comics #2. Bill Norris, American exchange student in Paris, ends up in a Nazi concentration camp and meets the head of the French Underground. He devoted his life to battling the Nazis and costumed himself as the Grim Reaper, usually working behind enemy lines. 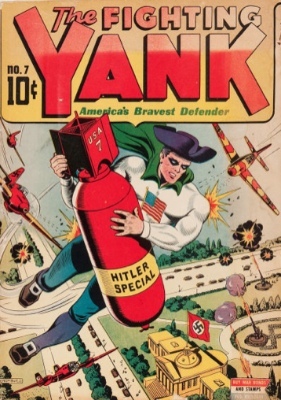 After Nedor folded, he ended up in the public domain, and was revived for a turn in the Tom Strong series by Alan Moore. 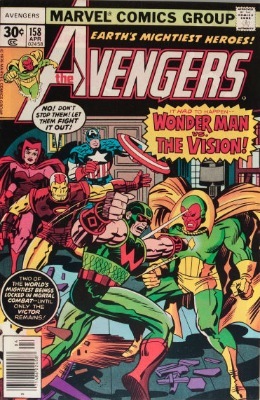 As the brother of Simon Williams (Wonder Man), Eric was often overlooked and neglected. When Simon was killed by Baron von Zemo, Eric blamed the Avengers and took matters into his own hands. Crafting a scythe with deadly abilities, Eric became the Grim Reaper and swore revenge against the Avengers. Grottu was a giant sized ant and a Deviant Mutate. 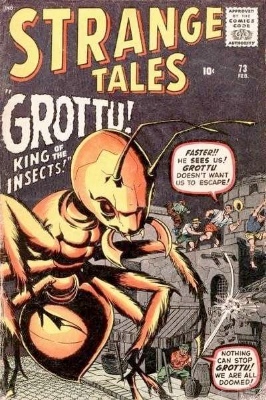 Grottu had superhuman strength, the ability to command other insects, and the ability to talk to humans. Over the years, Grottu was often embattled with Ant-Man and the Fantastic Four, until his body was incinerated by the Human Torch. Grottu was also considered a try-out for the Ant-Man concept. Growing Man is an alien android that has the ability to grow rapidly. As he grows, so does his strength and durability. 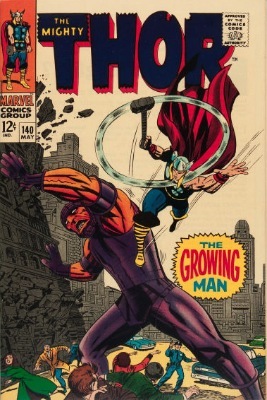 Under control of the evil Kang the Conqueror, Growing Man causes havoc in New York City, until stopped by Thor. Growing Man's normal size is that of a doll or action figure, but he can grow hundreds of feet tall. The surprise superhero movie hit of the summer, Guardians of the Galaxy is a super-team with a comedic twist. A sequel is already announced by Marvel, so this team is here to stay. 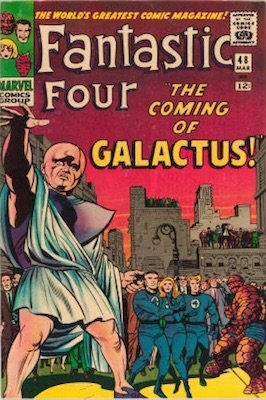 See the top 20 Silver Age comic books by value! The Guardians of the Universe live on the planet Oa, the center of the universe, and are responsible for creating and leading the Green Lantern Corps. They are the oldest living beings in the universe, and are immortal. 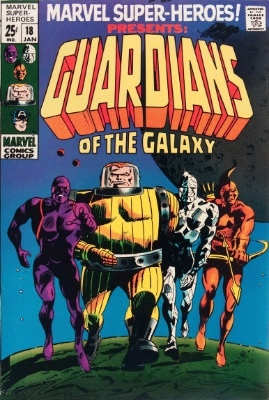 The Guardians are short, with blue skin, white hair, and largish heads.